Why come to Bus Solutions Orlando? The simple answer is that we’re the best at what we do. We’ll get your vehicle fixed right and we’re committed to providing excellent customer service. 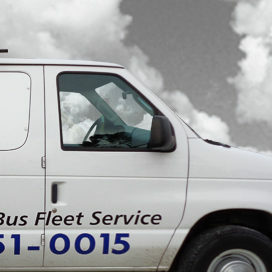 We’ve been in business since 2007 and we specialize in all types of shuttle bus and van service and repairs. We’re a one-stop shop. Bus Solutions believes in taking care of minor concerns before they advance to the point of a break down if at all possible. When our customers bring their buses in for service or inspections, we always check for noises, leaks, operations of all electrical systems and Air Conditioning operations. Any concerns that are in question, we bring to the attention of the customer. We find our customers would much rather take care of a minor concern early then be a victim of a breakdown possibly requiring a tow. In most cases of a breakdown, there are passengers on the bus. When a breakdown occurs, there is not only a need to find a wrecker equipped to tow the bus in but another bus to transport the passengers that are on the bus at the time of the breakdown. We understand that it is very difficult to bring your bus into the shop when there is only a 4 to 5 hour window during the day. Most of our daycare customers have two bus runs a day, one in the morning and one in the afternoon. Our daycare customers are all over Central Florida’s wide radius. 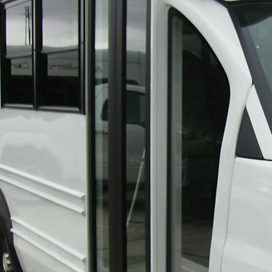 Bus Solutions offers on site inspections with minor repairs such as light bulbs and wiper blades. There is a fee for the mobile service however, in some cases, it is worth the convenience for the customer. We cater to the customer’s needs in any way we possibly can. Bus Solutions is committed to taking care of the customer’s needs to meet their particular standards. We keep the customer informed of progress during the time their buses are in for service. We provide written estimates. We believe in using the highest quality parts either from the original manufacturer or equal quality from an aftermarket manufacturer. Bus Solutions gives an above standard warranty on parts and labor. Our warranty policy is just another reason we have maintained a loyal clientele. We never hesitate to back up a repair that may result in a failed component. The occasions to process a repair under warranty are rare because we insist on using good quality parts. Our customers like that!